I focus on emerging challenges for open access such as the enclosure efforts by publishers, which has led to a growing number of takedowns and the use of digital rights management to lock down publications. With the Canadian Copyright Act review slated to commence shortly, I emphasize the connection between open access, open educational resources and copyright, with some of the key issues involving term extension, notice-and-notice, statutory damages, and fair dealing. 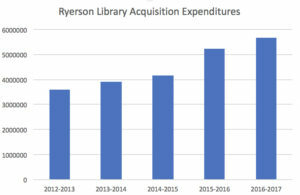 The Dalhousie and Ryerson numbers are consistent with data from Statistics Canada, which surveys the Canadian Association of University Business Officers on university spending. It shows the increased spending since the fair dealing decisions and reform is national in scope. The full talk explores these issues and how those concerned with balanced copyright can become engaged at the institutional, national, and international levels. The shift, not decline Geist invokes is a shift to large foreign players away from returning money to independent Canadian authors and small publishers. Isn’t this an argument for less reliance on passive government mandated revenue sharing (ie Copyright Board based collectives) and more on active private sector driven revenue sharing? Not that Copyright Board collectives aren’t doing some of this private sector driven revenue sharing. Bottom line, we need to put more of our IP to work in order to drive innovation. In today’s more sharing based and partnership driven economy, we need to explore new ways to get our IP actively working – both for creators and users. Let’s see if the Copyright Act review takes us there. 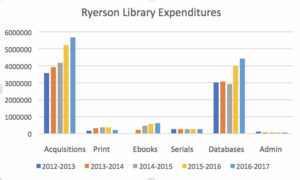 So that expense by category chart raises the question: How did dalhousie spending on databases (a purely corporate product) jump 33% ($3 million to $4 million) from 2014-15 to 2015-16? What’s going on there?